You are here: Home / Tours and Live Performances / 2016 The Original High / This and That With Adam Lambert! Adam Lambert is full-swing into his The Original High tour. He just gave a fantastic concert today in Auckland, New Zealand. In fact, here’s a concert review from the future, since it’s the next day in Auckland where this was published! For our website, we’ve chosen not to focus on putting out all the videos and reviews of Adam’s concerts since you can get them much faster via Live Stream, Twitter, YouTube, etc. Instead, we like to post other items we find that fill out even more sides of Adam. Here’s a few to start out your weekend. Let’s begin with this delicious tidbit! Adam singing the song in an Oreos commercial! And let’s celebrate a look at 7 Years of Adam Lambert! This was posted by goldandleather. I’m not sure if they’re the originator of this piece. And lastly a completely enjoyable radio interview with deejays Dana & Jason In the Morning, from Long Island, NY at WBLI.com where Adam Talks Money, Cover Songs & Rocky Horror! What great tidbits. The tribute video was awesome! What a great review. I hope he sells out some venues in the US. They aren’t as supportive as people in Australia. I’ll be going to his shows in Wisconsin and Illinois. I am so glad to see this. I’ll be going to the Wisconsin show. I may go to another, if I find a venue that has seating and not just GA. I wish he picked areas with seati8ng ! I’ve been to 3 of his Glamnation shows, the I Heart in Vegas with Queen. Not to mention 3 U.S. shows with Queen, one fabulous New Years Eve with Queen in London, and a GA in Poland. I’m short, and even though we were in line early, standing only 2 rows back, still couldn’t see ! I can hardly wait to see his concert in Atlantic city. Finally ! I would like to hear Adam sing David Bowie’s ” Lets Dance ” I am sure it was awesome. I would like to see Adam in concert. I don’t think I am ever going to get the chance where I live. But I still love him after all this time! Always will. he is a great singer! Love you Adam. I also hope all his shows are sold out. I saw him once at Hard Rock when I lived in Fl. Many years ago. Now that I live in TN the closest place is Charlotte NC but it’s general admission and I really can’t stand on my knee for that long. He is playing in Nashville but I would be going by myself and it’s a really LONG drive. So thank GOD for this website so I can watch the whole concert. Have you tried finding other Glamberts near you, that you could share the trip with? If you need some search suggestions, let us know. It would be so wonderful if you could see him live! I don’t know anyone. I live in Elizabethton Tn. Near Johnson City. I would love to share a ride. It would have to be in Nashville cause Charlotte NC is general admission. If you know of anyone let me know. My email is juniorboxer@centurylink.net. Name Rose, phone 423-542-0046. Never even thought of it. Thanks Carol. 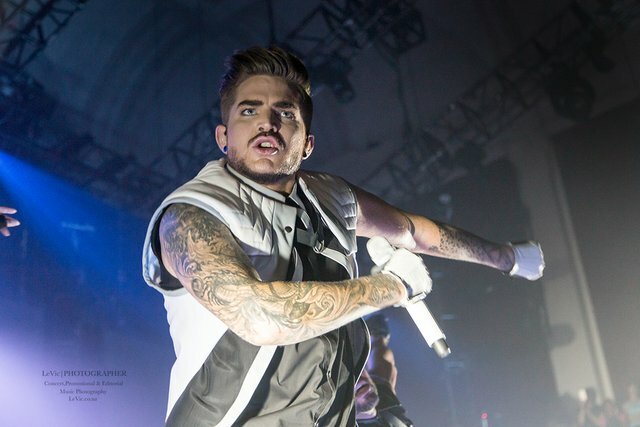 I didn’t want that 7 years of Adam Lambert to end! That was awesome!!!!!!!!!! I am so bummed that he is coming in February to a venue near me and I am unable to go. I want to see him live again. I had the pleasure of seeing him in Bethlehem, Pa. around 6 years ago. I put his concert right up there with David Bowie, who has been my favorite singer since I was a young teenager, until Adam came along. I am very big fan!!! I love songs with Adam.